These dumbbells are made of ultra low emission cast iron for enhanced durability. CAP Barbell 150 lb Eco Dumbbell Weight Set with Rack Dumbbell heads have an anti-roll 10 sided design. Dumbbells are made of ultra low emission cast iron material. NEW IN THE BOX THIS IS A CAP 2 TIER DUMBBELL RACK. HOLDS UP TO 300 LBS. IT IS FOR THE RACK ONLY (NO WEIGHTS INCLUDED). 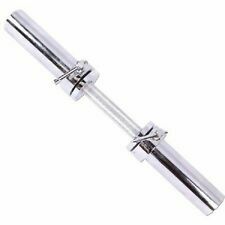 CAP Barbell 20" Olympic Dumbbell Handle with Collars - Brand New! You can easily affix your weights to it for a customized, strength training routine. Pair it with another one to do dumbbell bench presses and shoulder curls or use it alone for tricep kickbacks. The 20" dumbbell handle accommodates 2" plates. This weight plate tree can accomodate any 1' barbell plate and is designed to fit easily even in small rooms. Now you can keep your weight plates organized and ready for use more easily than ever. Holds all 1' plates. Warning: This product contains one or more phthalate chemicals known to the state of California to cause birth defects and other reproductive harm. Durable cast iron plates have a semi-gloss finish. Collars are threaded for a secure fit to handles. Cap Barbell 14 Dumbbell. Make sure this fits. by entering your model number. Product Details Item model number: SDAB-14T. Launched in 1982 with a small inventory of free weights and benches, CAP Barbell has grown over the past 20 years to include more than 600 products in 10 categories. Fully adjustable dumbbell - up to 40 lbs. The pvc coating does not have any rubber odor typically associated with rubber coated dumbbells. CAP Barbell Color Coated Hex Single Dumbbell 15 lbs. Dumbbell heads are made of solid cast iron. We usually respond within 12 hours. Durable cast iron plates have a semi-gloss finish. Fully adjustable dumbbell - up to 40 lbs. Create several weight combinations. Threaded steel bar with spin-lock collars. Includes sturdy carrying case. The benefits of dumbbell exercises include muscle building, improving core strength, boosting balance, providing better bone health, burning calories, increasing energy levels, enhancing overall mood and more. FEATURESIncrease strength and define muscles with the CAP Barbell Curl Bar Dumbbell Handle Combo Set. They can also be used in forearm exercises! This kit is vital to any weight training routine and is great for beginners and fitness experts alike. The solid steel bars equipped with collars provide enhanced durability and safety. This kit is vital to any weight training routine and is great for beginners and fitness experts alike. Each dumbbell handle holds up to 150 lbs of weight. Dumbbell heads have an anti-roll, 10-sided design. CAP Barbell. Dumbbells are made of a combination of eco-friendly material and cast iron. Materials: Steel, cast iron. We stand behind our products. Increase strength, and define muscles with the CAP Barbell Olympic Curl Bar/Dumbbell Handle Combo Set. The solid steel bars equipped with collars provide enhanced durability and safety. This kit is vital to any weight training routine and is great for beginners and fitness experts alike. Increase strength and define muscles with the CAP Barbell Curl Bar Dumbbell Handle Combo Set. They can also be used in forearm exercises! This kit is vital to any weight training routine and is great for beginners and fitness experts alike. Cast Iron Adjustable Dumbbells Fitness Weight Gym Barbell Body Workout With Case Make sure this fits by entering your model number.WHAT’S INCLUDED – 40 pound set includes two handles, four 2.5-pound plates, four 5-pound plates, 4 collars, and a plastic storage/carrying caseCONSTRUCTION – Durable cast iron plates have a semi-gloss finish offers a rust and maintenance-free product. Dumbbell handles are made from solid steelFEATURES – Set features ergonomic grips, comfortable handles, and rubber trimmed collars. Collars are threaded for a secure fit to handlesVERSATILE – Dumbbells offer the ability to target specific muscle groups or get a full body workoutFUNCTIONAL – Perfect for isolations, full body, functional, and HIIT workoutsTRUST – Trust experience. CAP has been a.
Combo Set CAP Barbell 1" Curl Bar 47" Standard EZ & Dumbbell Handles Weight Gym Increase strength and define muscles with the CAP Barbell Curl Bar Dumbbell Handle Combo Set. This set includes one 47-inch solid standard EZ curl bar, two 14-inch solid standard dumbbell handles and six spring clip collars. Everything you need to customize your workout in one affordable, high quality package. Made of solid chromed steel, the items in this set are durable enough to stand up to the most rigorous workout routines and are built to last. The curl bar and dumbbell handles are equipped with smooth ends and knurled hand grips that reduce slippage and allow a proper grip. With the inclusion of the six spring collar grips, you can rest assure you are not sacrificing safety. Increase your upper arm and core strength with the CAP Barbell Standard 14" Dumbbell Handle. Strength training can help improve your look, release stress and tension, burn fat and increase muscle mass. Dumbbell handles are made from solid steel. TRUST – Trust experience. CAP has been a pioneer in the fitness industry for over 30 years and has locations worldwide. Chances are, if you have ever worked out before you have used a CAP product. These dumbbells are made of ultra low emission cast iron for enhanced durability. CAP Barbell 150 lb Eco Dumbbell Weight Set with Rack Dumbbell heads have an anti-roll 10 sided design. CAP Barbell. The PVC coating does not have any strong odor, typically associated with rubber coated dumbbells. Hexagon shaped dumbbell heads are designed to prevent rolling and provide easier storage. Made of solid cast iron with a protective colorful coating. Cap Barbell 14 Dumbbell. We would love to be given the opportunity to work with you to resolve any problem you may have. Need your item quicker?. Make sure this fits. by entering your model number. Each dumbbell handle holds up to 150 lbs of weight. Curl bar holds up to 200 lbs of weight. Accommodates 2" hole plates. Smooth ends. Dumbbell heads are made of solid cast iron. Make sure this fits. by entering your model number. Item model number: SDP-015.